The Ant & Mike Show - "We Do More Than Gossip": Prisoners Can Vote...(kind of)!! Shout outs to Vermont and Maine!! 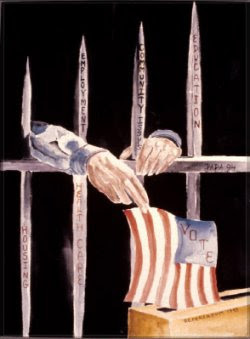 They are the ONLY two states in the country that allow prisoners to vote. Prisoners can register to vote and receive an absentee ballot as long as they had an address in one of the two states before they got incarcerated. I wish more states had a law like this, especially ones where the prison rate is nearly as large as the population. Prisoners aren't dumb, they aren't uninformed and they aren't incapable of filling out a ballot in the same manner as everyone else. I don't advocate committing crimes, but if you're gonna get locked up, do it where your vote still counts. Go to Yahoo! to read more.